Wonderful community with awesome amenities! 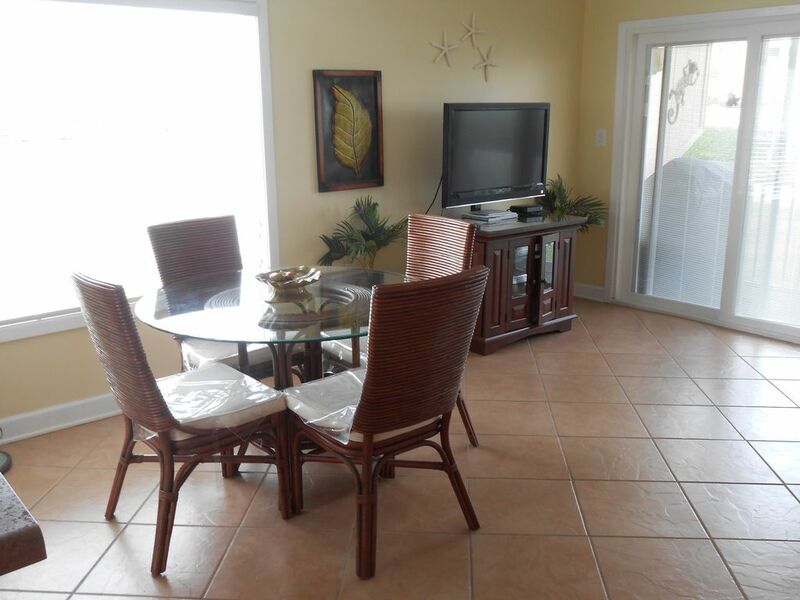 If you are looking for a vacation 'Destin'ation we have a place for you in Sandpiper Cove. Our rates are as competitive as any in the community. We have a spacious, fully-furnished, two bedroom condominium with a king-size bed in the large master suite, and a standard-size and twin-size bed in the second bedroom. The sofas in the living area are both sleepers. There is a full-size washer and dryer in the unit. We are located at the fifth hole tee of the private nine-hole, par-three golf course. From our condominium, it is a short walk to the private, white-sand beach of the Gulf. Our gated community has five swimming pools, six tennis courts and three hot tubs. Sports equipment is furnished FREE to our guests in the Sandpiper Cove office. WiFi, wireless internet access is picked-up in the unit and is always available nearby in the Sandpiper Cove office during business hours. Plus, our on-site Louisiana Lagniappe Restaurant has a wonderful harbor view and outdoor seating. Sandpiper Cove is located in Destin, Florida between Fort Walton Beach and Panama City. We are a group of family members who one day decided we wanted to purchase a piece of paradise. We reside in Louisville, KY - about an eleven hour drive from Destin. We hope you enjoy Sandpiper Cove as much as each of us does every time we travel down! Buying this condo in the private/gated community of Sandpiper Cove was smart. Our location within the community is great and the Gulf is just steps away. Security is a 24 hour operation. The wonderful thing is we never have to leave the property. We chose to buy in Destin because it is a quaint beach town, next to Fort Walton Beach and nestled between Pensacola and Panama City. Plus, New Orleans is just a few hours away! Our condo is newly remodeled with new flooring, appliances and cabinetry in the kitchen, bath and living area. Sandpiper Cove offers many amenities - tennis (6 courts), golf (9 hole, par-3), pools (5, two heated) and more. Security is on duty at all times. We even have an on-site restaurant, Louisiana Lagniappe with outdoor seating and a harbor view. Everyone is always friendly and helpful! Located beachside is a snack bar and a beach service offering daily or weekly rates. Come to play, rest or take a relaxing walk on the sugar-white sand while enjoying the emerald green water. It's often just what the body needs! Completely remodeled and updated. Contains everything you need to prepare and enjoy meals.